In Tribe Novel: Bone Gnawers, valiant Garou warriors return to Eastern Europe to eradicate the growing evil that has confounded their efforts thus far. Where the mighty and noble have failed, hope now rests with humble werewolves who make their homes in filth. In Tribe Novel: Stargazers, Antonine Teardrop may hold the key to Garou victory against the evil of Eastern Europe, but his tribes withdrawal from the Garou Nation may have damaged his credibility beyond repair. Even if it has not, servants of the Wyrm want him dead. 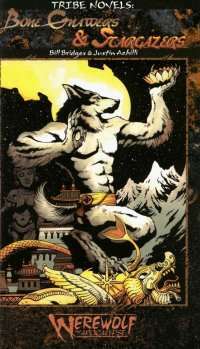 Justin Achilli is White Wolfs Vampire: The Masquerade developer and is the author of Clan Novel: Giovanni. Bill Bridges is the former Werewolf: The Apocalypse developer and he has written numerous works of Werewolf fiction, including The Silver Crown.